Got a new ramp to assist your dog with entering and exiting your vehicle, but your dog won’t use it? No problem! With a little love, patience and conditioning, your dog will learn to use the new ramp confidently and without hesitation. The new dog ramp will quickly become a staple of travel, for both you and your canine companion. As avid dog lovers, we are all too aware that the function and usefulness of a dog ramp is not necessarily “intuitive” to all dogs. Many dogs must be acclimated to both the logic and the stability of a dog ramp before they will actually use one. Keep in mind, that just because your dog may not immediately understand what the ramp is for, this does mean your dog is any less intelligent than one that shows no initial hesitation toward the ramp. In fact, it’s quite the opposite, your dog might just be a little more cautious and weary of new obstacles. Just like everything that’s new in life, using the ramp may be difficult at first, but once your dog does it once or twice, it will become second nature. Customer feedback has been instrumental toward the need of the following information. It is not uncommon for us to receive letters and phone calls from dog owners who are experiencing this very same issue. We did some research into this common problem and found quite a few unconventional ideas, as well as some pretty interesting ones. We found some information online, and in books, but our most reliable feedback came from Dog Agility Training Experts. After reviewing our findings and identifying the most widely recommended ways of going about teaching a dog to use an elevated ramp, here’s what we found to be the most non-invasive and successful method of conditioning a dog to trust and use a dog ramp. Unfold your new dog ramp, and lay it flat on a floor or level ground. Using a leash or verbal commands, walk your dog along the full length of the ramp surface and back again. Since the ramp is flat on the ground, your dog shouldn’t mind this at all. Do this as many times as needed for your dog to become familiar and comfortable with the ramp. Many dogs will “get it” in just a couple of trips back and forth along the ramp. Others may require more repetitions. If your dog does not seem interested in playing along with this exercise, give your dog a break, away from the ramp. Try again in a couple of hours or the even next day. If your dog has difficulty following directions, try eliminating distractions. Perhaps performing the exercise indoors and away from all the distractions of the outside world. Once your dog has mastered the concept of walking the along the ramp while flat on the ground, place the “vehicle” end of the ramp on the a bottom level step of any stairs that are handy. If you have no steps, you can improvise using lumber, bricks, blocks of wood, or whatever is available. Important Note: Be sure the ramp is solid, stable, and cannot move or jiggle when in use. Slowly and deliberately walk your dog up and down along the inclined ramp. Conduct this exercise using the same repetition as when the ramp was flat on the ground or floor. Do this as many times as needed for your dog to become comfortable with the ramp at a slight incline. Once your dog has mastered the concept of walking the along the ramp while slightly inclined, move the ramp up to the next step and repeat the same exercise as before, but at a slightly greater incline. Continue repeating this exercise while slowly increasing the incline until the elevation of the ramp is equivalent the to height of your vehicle’s point-of-entry, and until your dog understands that the ramp is safe and comfortable. 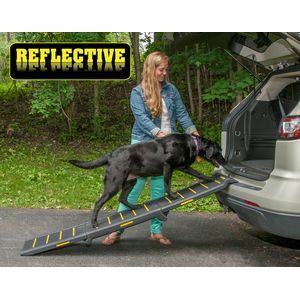 Once your dog can walk up and down the ramp from the ground to the greatest incline, he or she is ready to begin using the ramp to enter and exit your vehicle. Your dog might catch on quickly, or it may take more conditioning. Feel free to adjust the steps above to best suit your dogs’ learning curve.